Castor Oil is good for treating serious skin conditions such as acne because it is particularly rich in Omega-9 fatty acids. These acids are known to have remarkable anti-inflammatory and antibacterial properties, and therefore, in recent years, castor oil has been popular to healing acne. More specifically, Castor oil is rich in ricinoleic acid (more than 90%), which according to wiki, is an unsaturated omega-9 fatty acid which is a very effective natural anti-bacterial and anti-fungal agent. In addition, Ricinoleic acid is of low molecular weight and therefore has the ability to penetrate the skin. In fact, it can penetrate the stratum corneum, the outer layer of the skin which consists of dead skin cells and protects the underlying tissues from dehydration, infection or chemicals. Due to these features, Castor Oil is considered good for cases of acne and is effective at deeply purifying sebum and cleansing the skin, softening hard blackheads and generally treating pimples. It is also ideal for eczema and is widely used in anti-aging skincare products to activate the production of collagen and elastin as well as reduce wrinkles and fine lines. Furthermore, castor oil is an effective natural moisturizer as it has the ability to “trap” the skin moisture, preventing dehydration and premature aging. 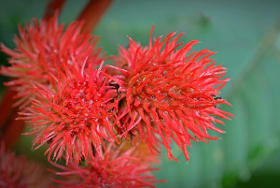 For me, castor oil is one of the best skincare products I have ever used and it works fast. For example, I still remember the first time I used it on my forehead and completely got rid of my forehead fine lines, moisturizing my skin effectively and keeping the moisture sealed in the skin for long. The advantages of using castor oil on the skin are many including its price since it is a particularly cost effective natural product of which a little goes a long way, and the only disadvantage I can think of is its thick texture. Nevertheless, the moisturization you get from this product is really amazing. Find the Best Options of Organic Castor Oil Reviewed! If you have acne, dry skin, chronic itching, skin inflammation from the sun or even stretch marks, soak a piece of cotton in the castor oil and apply it to the point that you have a problem both in the morning and evening. If the area is small, (for example an infected pimple) apply little castor oil on the area and cover it with a band aid. Another way is to mix 1 tablespoon of extra virgin olive oil with 3 tablespoons of castor oil. When your face is dry, put about ¼ of the mixture in your hand and rub until it reaches body temperature. Then, apply on your face and massage for about one minute, emphasizing on the nose or those areas that acne pimples appear. Afterwards, cover your face with a wet warm towel so that the heat opens up the pores. Repeat the procedure until your skin feels clean. Finally rinse with water. You can follow this castor oil acne treatment for six weeks. If you do not experience the desired results within this time, then you should consult a dermatologist. Another similar way to use castor oil for acne is first to gently cleanse your skin with a good face wash for acne. Use warm water to open up pores and clean more easily since this will remove oiliness more easily. Dampen a towel with warm water and apply some castor oil on the towel -amount equal to a coin- and, using gentle circular movements, focus on the areas of the face with acne or other blemishes like blackheads. Allow the castor oil to remain on your skin overnight to adequately hydrate it. In the morning, gently wash off the castor oil using your daily facial cleanser. To conclude, Castor oil is a good natural product to use for acne which won´t dry out your skin like some other acne products but will keep it wonderfully moisturized and less inflamed.